"Two years ago we had the same underfoot conditions when they closed the roof, it was drier today then it was the last time," said Schmidt. "Whoever gets ahead early on is always harder to catch. They won the toss and got the ball behind us and that's how fine the margins are. "Maybe it was a mistake not to have the roof closed. In hindsight, what would it have looked like if the roof was closed? I don't know. You deal with that you deal with it and that's the way we've always been." Schmidt also alluded to the difficulties of a six-day around as well as a minor bug which meant some players had to be separated from the rest of the squad. "We had a couple of guys who were struggling who had a bug," said Schmidt. "Sometimes they were isolated. Apart from that, the six-day turnaround is always a little bit complicated, we spent the first two or three days recovering and got a good head out on Thursday. "Is it as much preparation as you'd like? Probably it's not but at the same time that's the nature of the draw. I remember saying last year that we knew when we got the draw there was the potential if we won away in France that we could get potentially the Grand Slam. "We probably didn't say it but ironically, Gat said it at the start that if they won in France he felt they could get the Grand Slam and that's what they did." 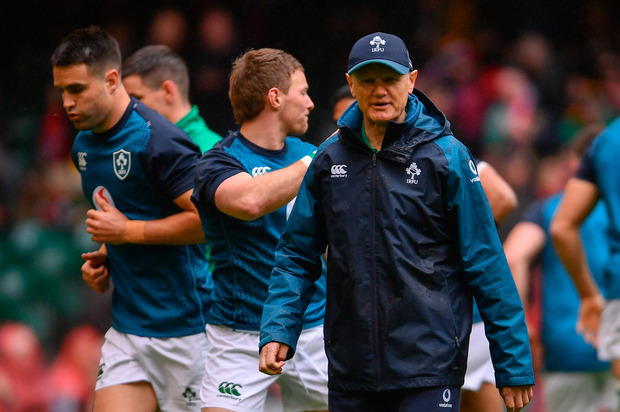 The Ireland coach urged supporters to keep faith with his side ahead of the World Cup as his side swapped places with Grand Slam winners Wales, who are now second, in the world rankings. "I guess you guys have set the narrative, we can only perform within those two 40 minutes and then the narrative is taken up by pundits. "We would urge the supporters not to lose faith, The team will perform in Japan. England were fifth last year after being back-to-back champions. "We haven't been catastrophic but we haven't been as good as we needed to be. I take my hat off to Warren Gatland. "To be twelve years as an international coach and be so competitive, I've done six years and it nearly killed me. "You could see what it meant to them. They know how to fight their way to the finish." Schmidt claimed the performance was not as disappointing as the opening day defeat to England. "It was not as disappointing as the one we started the competition was. While the score got away from us, I don't think performance wise we were as far off as we were at the start. "They got the benefit of some set-piece decisions and built off their first try. We knew what they were going to do, a bit like we knew what England were going to do, but it was hard to stop them. "Warren Gatland spoke about the 5% extra you get from going for a Grand Slam, we benefited from that belief of those four wins in Twickenham last year. "The way that game started added to that belief. We were unlucky with a couple of calls, they defended well and our discipline wasn't what it needed to be."